In the early 1960s, two motorcycle racers—Ken Johnson and Norm McDonald—developed a ground-breaking new idea for an air filter that could perform under the demands of an off-road environment. After experimenting with many different types of filter media, they discovered that an oiled cotton design allowed the filter to not only capture dirt and contaminants very efficiently, but also allowed it to be washed and reused. Just like that, the original High-Flow Air Filter™ was born. To this day, K&N continues to be an industry leader in filtration technology—and engineers each air filter for efficiency, capacity, durability, and airflow. Maintaining the proper air-to-fuel ratio (AFR) is critical for engine performance, and relates to the amount of air versus the amount of fuel used by an engine for combustion. A correct, stoichiometrically balanced AFR produces combustion with perfect efficiency, excluding other factors. For gasoline engines, the theoretically perfect chemical ratio is 14.7:1—14.7 parts air to one part fuel. In effect, this means that an engine requires almost fifteen times more air than fuel for efficient combustion—which emphasizes the importance of providing a high volume of air through an air filter. How do engines produce power? An internal combustion engine operates by burning a mixture of fuel and oxygen within the engine’s cylinders. A spark plug ignites the volatile gas, creating an explosion that forces the piston downward—turning the crankshaft. The piston-moving force that’s created during the combustion cycle is what produces horsepower. Typical disposable paper air filters function on a size-dependent basis—dirt particles that are larger than the openings in the filter media are blocked, while particles that are smaller than the openings can pass through. Most disposable paper filters create airflow restriction, as the openings in the filter media have to be tiny in order to filter efficiently—which can slow down airflow. Because dust accumulates on the surface of the disposable filter and can block passageways for airflow, the filter’s performance typically decreases consistently throughout its service interval. K&N designs every K&N filter to balance the four most critical elements of filtration: efficiency, capacity, durability, and airflow. Under normal circumstances, most automotive air filters demonstrate an inverse relationship between airflow and efficiency—the higher the airflow, the less efficient the air filter is at protecting the engine, and vice versa. Many filter companies claim that their filters capture 99% of contaminants (or more), but there’s a trade-off, as most filters designed to block almost all contaminants are likely to also block the majority of airflow—stifling your engine’s oxygen supply. A standard disposable paper filter exhibits a principle called surface loading—dust collects only on the surface of the media, which can provide a high level of contaminant capture/efficiency (the filter is mostly impermeable, which keeps dirt and contaminants from passing through to the engine) but a low level of airflow, reducing engine performance. In contrast, K&N High-Flow Air Filters™ utilize depth loading, in which multiple layers of pleated cotton fibers provide particle retention on many levels. However, while most typical paper or foam filters would experience an unacceptable reduction in airflow with a dramatic increase in efficiency, High-Flow Air Filters™ are specifically engineered to capture dirt while still allowing a high volume of airflow to pass through. As a result, High-Flow Air Filters™ are able to capture contaminants (efficiency), hold a large volume of dirt (capacity), and still provide an outstandingly high volume of air to the engine (airflow). In addition, High-Flow Air Filters™ are designed to last for the entire lifespan of a vehicle (durability). If I can see light through my air filter, does that mean that dirt is getting through too? Some consumers have expressed concern that when holding a K&N High-Flow Air Filter™ up to a light source, there are holes/passageways visible in the filter media. If High-Flow Air Filters™ operated solely on a size-dependent basis like a typical disposable air filter, this would be a valid concern—the assumption being that any particles smaller than the passageways would flow through to the engine—but High-Flow Air Filters™ are designed to utilize the principle of diffusion to increase the capture of engine contaminants. Extremely small particles are typically highly affected by forces within the flow of air, including changes in pressure, velocity, or turbulence—and these factors often make their behavior chaotic. While this erratic behavior might sound detrimental to filtration, it can actually be an advantage, as the smallest particles typically do not follow the main flow of air through the passageways in the filter; instead, their chaotic motion causes them to collide with microscopic fibers inside the filter media, where they are then trapped and held by the filter oil. 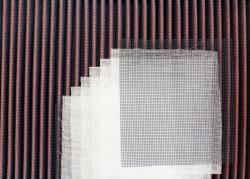 In the media of a typical disposable paper filter, any particles that are smaller than the openings in the media will likely pass right through—but the tacky, sticky nature of K&N filter oil and the multi-layer media design of High-Flow Air Filters™ help capture contaminant particles that are much smaller than the openings/passageways within the filtration media. 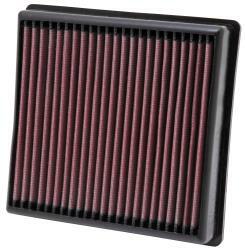 Can a K&N oiled air filter cause a mass airflow sensor to fail? An unsubstantiated claim has circulated for many years saying that K&N oiled air filters can cause mass airflow sensors to fail. K&N has thoroughly investigated this claim, and has found no evidence to suggest that K&N filter oil is able to cause MAF sensor damage. In fact, over the past several years, K&N has compiled data regarding MAF sensors sent in by consumers and dealerships, which you can view here: MAF Sensor Test Results. In most cases, the MAF sensors were actually working as they should—which would be a perplexing result, if not for the fact that most dealerships are unable to test MAF sensors. K&N has yet to encounter a dealership with the test equipment necessary to determine whether or not an MAF sensor is functioning properly, which frequently leads to misdiagnosis. For this reason, in almost all cases, the diagnosis of a faulty MAF sensor is merely an educated—or sometimes uneducated—guess. However, in response to consumer concerns, K&N performed extensive testing to determine whether or not filter oil could cause an MAF sensor to fail—going so far as to completely coat an MAF sensor in filter oil—and was not able to create a scenario in which the MAF sensor was damaged by the oil (you can view the procedure and results here: MAF Testing Results and Findings). In K&N’s study, of 437 sensors tested, 298 of them were actually functioning properly (68.19%)—indicating that misdiagnosis of MAF sensors is a frequent issue. Of the sensors that were truly malfunctioning, approximately 33% demonstrated complete electronic failure, with 67% experiencing electrical variance. Of the latter category, over 36% were found to be manufacturer-contaminated with silicone. K&N filter oil was not found to be responsible for any of the sensor malfunctions. While the oiled High-Flow Air Filter™ continues to be the most popular filter type among K&N products, K&N also offers non-oiled synthetic Dryflow® air filters. The Dryflow® filter media is composed of lofted synthetic material, which—much like High-Flow Air Filter™ media—provides depth loading properties. However, since Dryflow® filters do not feature the K&N filter oil that is designed to trap and hold particles, the Dryflow® filter media is more restrictive to airflow than High-Flow Air Filter™ media—though it is still designed to strike a desirable balance between airflow and efficiency, provide a high level of contaminant capture, and outperform typical disposable paper air filters in airflow. Because they do not have to be re-oiled, servicing Dryflow® air filters is typically a quick and easy process. 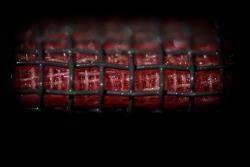 K&N engineers each filter media type to provide performance for specific applications—for example, heavy diesel and outdoor power High-Flow Air Filters™ are designed with six layers of cotton that feature a particularly fine weave, which can provide an additional level of protection in demanding driving conditions. Synthetic, non-oiled Dryflow® filter media is incorporated into many heavy duty diesel filters, and a large, conical Dryflow® air filter is included with Blackhawk Induction™ intake systems. Many applications will have multiple filter options available, allowing you to select the filter type that fits your needs and preferences. 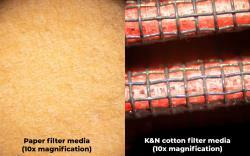 If you have questions regarding filter types, please feel free to contact K&N’s customer service. Join the millions of customers who trust K&N to provide performance and protection products for their vehicles. Visit the application search page to explore air filter options for your specific vehicle.